A Russian startup said Wednesday it will launch several satellites in the coming weeks, the country's first private satellite constellation, to offer maritime monitoring services. Dauria Aerospace will on Thursday launch two satellites, to be followed by another one in July, and begin offering navigation help for ocean ships and river vessels in cooperation with the Russian transportation ministry. 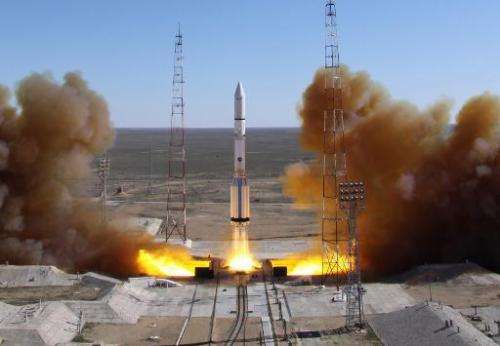 "It will be the first Russian private satellite constellation," Vitaly Yegorov, spokesman for Dauria Aerospace, told AFP. The third satellite was completely financed, designed and assembled by private companies, and could provide a much-needed boost for the country's beleaguered state-controlled space industry. The Russian government is scrambling to overhaul its space programme after setbacks including the loss of several satellites and an unmanned supply ship to the International Space Station, but legislation has so far discouraged private initiatives in the sector. Established in 2011, Dauria Aerospace is controlled by a Russian entrepreneur and brings together experts with experience in the Russian space programme and NASA. "In the future, we will probably cooperate with foreign companies to exchange data for further research," added Yegorov.